On Sunday July 4, 2010, Rev. Tony Ponticello addressed the congregation at the Community Miracles Centerin San Francisco, California. What follows is a lightly edited transcription of that lecture. Happy 4th of July! As you know, and I’ll remind you, this is the celebration of the signing of the Declaration of Independence that was signed in 1776. This means it was signed 234 years ago. I remember when we had the 200th anniversary of the signing of the Declaration of Independence. At that time, I was 22 years old. I remember that I was just a young man. 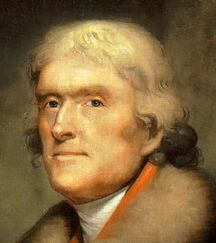 It is usually credited that Thomas Jefferson wrote the Declaration of Independence. He was a statesman. He was a plantation owner from Virginia. Virginia was considered a premier colony at that time because of it’s large population. Virginia produced lots of goods and had many plantations that used a lot of products that the colony needed to buy, usually from England. I want to stop for a minute. What’s kind of interesting for me here is that Jefferson is being polite to the British. He is being nice. He’s telling England what the colonies are doing in a very nice, respectful way. This is a very interesting paragraph. It actually fuels a lot of the vigilante type organizations that are involved in the country right now, because they figure that the government is not really addressing their rights. These vigilante organizations believe they have the right to act the way they do because of the Declaration of Independence. They can overthrow the government and form a new government. There is an interesting fact about the line that states, “We hold these truths to be self-evident, that all men are created equal ...” It’s about the “ self-evident” phrase. It actually was not the phrase that Thomas Jefferson wrote. Thomas Jefferson wrote something else. He wrote, “We hold these truths to be sacred and undeniable ....” That was his phrase, but before he submitted the Declaration of Independence, before it was complete, he ran it by Benjamin Franklin and Benjamin Franklin did not like the “sacred and undeniable” phrase. He didn’t like “sacred” because it sounded too preachy. He didn’t like “undeniable” because anybody can deny anything. He wanted something that couldn’t be argued with. He came up with phrase “ self-evident” and asked Thomas Jefferson if he would be willing to change the phrase. Thomas Jefferson said yes. This is interesting to me because a friend and I have been watching the television mini-series on the life of John Adams. In it, there is a scene where Benjamin Franklin convinces Thomas Jefferson to change the line from “sacred and undeniable ” to “ self-evident” This mini-series is very good, and I heartily recommend it. It’s very educational. It’s interesting how the thirteen colonies became the thirteen states. It’s also interesting when we think of what is in A Course In Miracles. What do we hold to be self-evident. I think that we do hold that all men and women are created equal. This quality is a self-evident thing. We don’t have to argue it or prove it in our minds. It is something that seems intuitive to us, and this self-evident truth is something that is certainly reinforced all through out ACIM. We are all equal. The Course says, “There is no order of difficulty in miracles because all of God’s Sons are of equal value, and their equality is their oneness. The whole power of God is in every part of Him, and nothing contradictory to His Will is either great or small. What does not exist has no size and no measure. To God all things are possible. And to Christ it is given to be like the Father.” (Tx.Or.Ed.10.68) The sons of God, or the children of God, or the sons and daughters of God, are all of equal value, and their equality is their oneness. There is a definite match between ACIM and what the Declaration of Independence says. It is both self-evident and it is also sacred and undeniable. I think that we learn this as we study A Course In Miracles and we get it continually reinforced. In another place in the Course it says, “Freedom cannot be learned by tyranny of any kind, and the perfect equality of all God’s Sons cannot be recognized through the dominion of one will over another. God’s Sons are equal in will, all being the Will of their Father. This is the only lesson I came to teach, knowing that it is true.” (Tx.Or.Ed.8.32) So there, again, is another quote from ACIM that talks about being equal, just like the Declaration of Independence talked about. Here’s another quote. It says “I have made it perfectly clear that I am like you and you are like me, but our fundamental equality can be demonstrated only through joint decision. You are free to perceive yourselves as persecuted if you choose. You might remember, however, when you do choose to react that way, that I was persecuted as the world judges and did not share this evaluation for myself.” (Tx.Or.Ed.6.8) This one is declaring that the sons and daughters of God are all equal to Jesus and that is one idea that took me a little getting used to. With my training in traditional Catholicism, my early religious training, I was not taught to think of myself as equal to Jesus. Yet this does become self-evident in A Course In Miracles and sacred and undeniable too. The more you study the Course these ideas get in your mind and stay there. Sometimes you wonder. When you think about the Declaration of Inde-pendence and it talks about “men” being created equal, did it actually only mean people of the male gender? Women, certainly, were not equal at that time, and not all men were equal either. There were slaves at that time. Thomas Jefferson, who wrote the Declaration of Independence, had slaves himself. The Declaration of Independence was an ideal that they were going for. It was not something that existed in the colonies at that time. The freedom that they were working towards was freedom from British rule. A Course In Miracles says “In this phase of learning, working miracles is more important because freedom from fear cannot be thrust upon you.” (Tx.Or.Ed.1.40) They were working for freedom from British rule. We, as A Course In Miracles students, are working for freedom from fear, from any kind of fear that seems to be out there in the world. It’s actually any kind of fear that exist in our minds. We’re working for freedom from fear so that we can be at peace. I did a little research on the colonies and what was going on in 1776. I thought it was interesting. I wanted to know how many people were actually living In the colonies at that time. In the thirteen colonies, during the time of the revolutionary war, there were 2,500,000 people living in the colonies. There were a substantial number. The largest city, at that time, was Philadelphia with 25,000 people. That was the reason why the Continental Congress was held in Philadelphia. It was the most metropolitan place. It was the most populated city, and it was probably the most advanced place technologically. It also happens to be the first place that the Capital of our country was located The first president to live in the White House, as depicted in that mini-series I spoke about, was our second President, John Adams. It’s interesting that President Adams and his First Lady moved into the White House before the White House was even finished. They actually moved him in when it still had dirt floors. It was vastly unfinished when President Adams and his wife moved in. I again find it interesting, that the other cities at the time: Boston, New York City, Charleston, all had populations of about 5,000. By today’s standards they were actually quite small. However, they were considered major cities at the time with 5,000 people. That was what was going on during the Revolutionary War time. These fledgling colonies were fighting for freedom. I remember a old cartoon of someone in a jail cell thinking that they were still a prisoner, but the truth was that most of the walls had crumbled away, and the chain that had tied the prisoner to the jail cell had rusted away near the wall. The prisoner just kept looking at the locked jail cell door, and the door was still intact. The prisoner also felt the locked iron cuff around his arm without realizing that the chain that had connected it to the wall had rusted away. The prisoner thought he was trapped in the jail cell but the chain had been severed and the walls had crumbled. I believe this is what A Course In Miracles is trying to say. Our chains have been severed and our walls have crumbled. We don’t have to severe the chains nor break down the walls. We just have to recognize that they are severed, crumbled and get up and walk away. We have to stop fixating our perception on the locked door and the metal cuff on our arm and know that we already are free. We can exercise that freedom now. There is nothing more that we have to obtain. We have already been given our freedom. We don’t have to earn it, and we don’t have any British to fight in order to establish our freedom. Our freedom has already been given to us. Maybe we do have to have our own Declaration of independence. I was thinking about that. Maybe we do have to have something that we say to ourselves that actually does declare our freedom for us. I think everybody should make up something for themselves. What truths do we hold sacred or undeniable? What truths do you hold self-evident? What truths will lead us to that freedom from fear that exists deep inside of us? Whatever we see on the outside is irrelevant to the fact that what we are looking for is on the inside. I wish I did see it on the outside. I think everybody wishes that they see it on the outside. I have been going through a particularly hard time. I talked about this the last time I spoke. It has not been an easy time for me. I’ve had a lot of troubling psychological issues, and I realized that I had put my freedom on things out there, a lot of things that existed in the world. Those things are not there any more. I put my freedom in having my partner Rev. Larry always being there to help me. I put my freedom in the idea that I was going to inherit half of Rev. Larry’s estate. That got taken away from me three days before he died. I put my freedom in the Community Miracles Center, the things that we were going to accomplish and that’s getting rattled and changed. I do get fearful around those things, but I am giving this lecture because I need to hear this lecture. A Course In Miracles tells us, “An earthly messenger fulfills his role by giving all the messages away. The messengers of God perform their part by their acceptance of His messages as for themselves and show they understand the messages by giving them away.” (Wk.Bk.Or.Ed.154.7) I know that I need to declare my freedom for myself. I know that I need my own Declaration of Independence. I need to know the truths that our self-evident for me. Like so many other people, I have worshiped idols. It’s time to let those idols go. A Course In Miracles says, “Let us not worship idols, nor believe in any laws idolatry would make to hide the freedom of the Son of God. He is not bound except by his beliefs. Yet what he is, is far beyond his faith in slavery or freedom. He is free because he is his Father’s Son. And he can not be bound unless God’s Truth can lie and God can will that He deceive Himself.” (Wk.Or.Ed.227.2) We really should not worship the idols that we have worshiped in the past. We have to know that God does not deceive us, and we can not deceive ourselves when we’re focusing on the right thing. It is only our beliefs that can bind us, and beliefs can be changed. Beliefs are merely ideas, and ideas can be changed. It just takes vigilance to identify the false ideas that you have and to replace them with the thoughts of God that you are given by the Holy Spirit to replace them with. This article appeared in the July 2010 (Vol. 24 No. 5) issue of Miracles Monthly. Miracles Monthly is published by Community Miracles Center in San Francisco, CA. CMC is supported solely by people just like you who: become CMC Supporting Members, Give Donations and Purchase Books and Products through us.